A portable air conditioner, also known as a mobile air conditioner, is an air conditioner that does not require permanent installation. They do not have any piece that will stick out from your window and are relatively lightweight and commonly have caster wheels for easy portability. They generally measure about 28 to 34 inches tall. Ideal for cooling single rooms, portable air conditioners are self-contained portable systems that typically sit on the floor – making them a good alternative to window units. A portable air conditioner’s mobility allows you to move it from room to room depending on which are needs cooling and where you are. Portable air conditioners are somewhat heavy (and sometimes weigh up to 40 kg). Portable air conditioners are extremely easy to install by following the DIY instruction provided. A window installation kit that is included in the package through which a small exhaust is to be placed so the heat from the air in your room can be removed and evacuated. Its front side discharges cool air into the room while its other side discharges hot air through the unit’s heat exchanger. The unit’s flexible exhaust tube that typically has a 5 inch or 3 ½ inch diameter discharges hot air outside your room. As a result of condensation, water droplets are collected in a bucket or tray inside the unit and are to be manually removed when it is full. There are units too that give you the option to drain the water collected by installing a drain hose to it. There are usually options for digital or manual type of controls, with the digital type usually coming with a set or room temperature display and a remote control and the manual type having minimal functions that are pretty straightforward. Digital type of controls may have other functions such as “Sleep”, which makes the set temperature of the portable air conditioner to automatically go up after certain hours of operation; this could be a useful feature for those who operate the unit when they sleep. This feature is also helpful by cooling the room as a relatively less cooling capacity is needed when you sleep compare to when you are active, helping you conserve energy and save on electricity. The automatic restart function could be useful in places where electric supply outages occur frequently. This allows the unit to turn off when it is operating and the electric supply cuts off and then turning it back on with the last user settings when the electricity resumes. The timer feature is useful as it turns off (or on) the unit after the set time. This is useful for people who might want to only turn on the unit for a certain time to cool the room during the night and use a fan afterwards – therefore saving electricity. These features are used to direct the course of the cool air that comes out from the portable air conditioner horizontally or vertically. Some units are only capable of doing this manually to remain at the particular location you set it too. On the other hand, more advanced and feature-rich units have built-in motors that automatically changes the louvre’s or swing’s position. As the name suggests, this feature measures the efficiency of the portable air conditioner. The higher the EER of a unit is, the better. This feature should be considered for those who might need heating during cold weathers (like winter). As opposed to units that only offer cooling, this feature is found in more expensive units. Having this option is an investment in the long run as it is better to use the portable air conditioning unit than not using it at all during the cold weather. Units with higher CFM further the discharge air’s ability to go. Portable air conditioners’ noise level should be as low as it can get as high noise levels might cause discomfort and may disturb the room’s occupants. Portable air conditioners are rated in BTUs (British Thermal Units) per hour. The higher the BTU rating is, the more cooling power the unit offers and the larger room it can cover. Choosing a portable air conditioning unit that is appropriate for your space is important so as energy and money is not wasted on a unit that cannot sufficiently cool your room. Portable air conditioners emit hot air during the cooling process that must be exhausted out of their hose. Choosing a portable air conditioning unit that comes with a window kit (most of them do) that is designed to expel warm air outside is ideal – but this means that it needs to be plugged in within a few feet of a window. Draining collected moisture is the only maintenance that you really have to worry about. Getting rid of moisture can be done in multiple ways like manually removing the pan and emptying it as needed, using a pump to push water up and out of the unit and into another location, and attaching a hose for draining into a different location. Some power cords may be a little short for your setup, and the placement of your portable air conditioner should be considered in relation to your power socket as it is not advisable to use an extension cord – portable air conditioners are quite power hungry, and using extension cords may pose an overheating or fire risk. Remote controls come in handy as it gives you the added benefit of information on your room temperature. Remote controls usually allow you to set automatic modes and timers to make life simpler as an LCD display allows you to see the cooling status without having to check and look at the unit’s screen from time to time. Fan-only mode, cool mode, heat mode (for reverse-cycle models), dry mode (dehumidify), and automatic mode are some operating modes of portable air conditioners. Automatic mode allows the unit to be set for a target temperature and switches to cool or heat mode as required. hose expel warm air and moisture while also pulling in more air to cool. On the bright side, both of them are fairly easy to install. Most portable air conditioners use typical household volt power and require no special outlets or wiring. Portable air conditioners or those commercial-grade ones with higher BTUs, on the other hand, may require special outlets or wiring. This is to be considered when choosing a portable air conditioner as they use a significant amount of energy and caution must be used to not overload a circuit. Energy consumption will of course vary depending on your environmental conditions and your portable air conditioner’s model. Easy-access handles and good clearance between the bottom of the unit and the floor are to look out for when choosing a portable air conditioning unit if you will be moving it from room to room. Honeywell designs and manufactures technologies addressing some of the world’s most critical challenges around productivity, energy, security, safety, and global urbanization. The solutions they make enhance the lives of people around the world while creating new markets and even industries. Combining 3-in-1 technology into one sleek body, Honeywell’s Contempo Series portable air conditioner cools and dehumidifies rooms that measure 550 to 700 square feet. Featuring a reliable dehumidifying function, an auto-evaporation system, and a traditional three-speed fan only function, the portable air conditioner delivers optimum dehumidifying function, cooling, and fresh ventilation. The portable air conditioner is designed for comfort – featuring three fan speeds, digital controls, sleep mode (allowing you to control the temperature for a comfortable night’s sleep), and a 24-hour energy saving timer. It also has a remote control that has a digital display – allowing you to operate the portable air conditioner’s every feature from across the room. This portable air conditioner is available in 9000 BTU, 10000 BTU, and 14000 BTU. Its dual filters protects it from hair and dust – extending the unit’s lifespan and performance. These filters could be easily cleaned under a faucet for easy maintenance. It also features an automatic vertical wind motion – helping on distributing cool air evenly throughout the room for consistent and fast cooling. There is also no bucket to empty for stress-free auto evaporation as it has a built-in dehumidifier that could remove up to 111 pints of water. Everything that’s needed for the portable air conditioner’s operation is included in the box, like a full set window kit and a flexible exhaust hose with a length of 4 feet. It also comes with a thermal overload protection on the motor and the compressor for additional safety precautions. With this portable air conditioning unit, you can enjoy precise and simple room climate control, thanks to its smart digital thermostat system. Whynter believes in redefining the way that people live by bringing exceptional products to make one’s day a whole lot more comfortable and easier. The products that they offer is designed around space utilization and portability – giving you the flexibility of using their products wherever and whenever you need it. They also make sure that their products are designed well and look good as combining function and form is something that they constantly strive for. Whynter’s ARC-14S is an eco-friendly portable air conditioner. It is lead-free, CFC-free, and has a high energy efficiency – helping you stay cool while reducing energy consumption and keeping up with better environmental standards. It features the CFC-free green R-410A refrigerant and lead-free RoHS-compliant components. It also has Whynter’s patented and advanced auto-drain technology, which recycles and uses moisture collected during the cooling process in order to produce cool air. Having a dual hose, it provides faster cooling and can keep a 500 square feet room cool. Its exterior has a two-tone design – platinum and black. This portable air conditioner has three operational modes: air conditioner, dehumidifier, and fan. It also has full thermostatic control with digital readout and a 24-hour programmable timer. Its fan van be set to 3 different speeds and it has a dehumidifying capacity of 101 pints per day. It has a maximum energy consumption of 1250 watts or 10.8 amperes. Its power supply is 115V/60Hz. The air flow at high speed is 222 CHM or 360 m/h. This portable air conditioner has an extendable intake and exhaust hose that can be extended to up to 60 inches and a window kit that measures up to 46 inches. It also comes with a protective cover with a pocket that is designed to protect your portable air conditioning unit and to store your window kit, exhaust hose, and remote control when the unit is not in use. The protective cover also keeps dirt and dust from accumulating on the unit when not in use. JHS is China’s biggest portable air conditioner manufacturer. Their products have been sold to more than 50 regions and countries, including North America, Europe, Australia, Asia, and South Africa. Their goal is to bring their customers a comfortable residential life. JHS has executed and established high-quality control, inspection procedures, and assurance standards in every step of their production process – passing dozens of international safety and quality certifications and environmental protection. The JHS A016-10KR/B1 portable air conditioner has a digital LED display panel, a touch button, and a remote control. It has a 24-hour programmable on and off timer, an auto-evaporation system, and a washable dust filter. It weighs 50lbs and has a full water indicator. This unit could also be controlled using JHS’ smart mobile app so you could control it whenever and wherever. Designed for portability, it is equipped with four reliable, all-direction stainless caster wheels and two handles – allowing it to roll freely into bedrooms, living rooms, offices, and much more. This portable air conditioner comes equipped with an upgraded compressor. With a cooling capacity of 10000 BTU, it is indeed a powerful unit that is capable of cooling larger areas that measure up to 220 square feet. It has an energy efficiency ratio of 2.61 Class A and a power consumption of 1280W / 11.5A / 115V / 60Hz. The JHS A016-10KR/B1 portable air conditioner has three functions: air conditioner, dehumidifier, and fan mode. It has a dehumidifying capacity of 50.7 pints per day. Another additional and cool feature of this unit is that it could be connected with Amazon’s Alexa Echo, allowing it to respond to voice commands. Frigidaire’s air conditioners are manufactured and tested to ensure that they maintain the preset room temperature to allow you to remain comfortable at all times. They aim to keep things running smoothly for you and your home. The FFPA1422U1 Portable Air Conditioner by Frigidaire has a SpaceWise portable design – it has caster wheels that allow you to move the unit from room to room to provide you with cool air wherever and whenever you need it. It makes use of the R410a refrigerant and measures 19 6/6 inches in width, 31 5/16 inches in height, and 16 9/16 in depth. It is black in color and has 14000 BTU for cooling and 4100 BTU for heating. Its filter is antibacterial – reducing bacteria, airborne particles, and odors for a more comfortable and healthier environment. It features a sleep mode function for maximum comfort throughout the night, while also saving on energy. With this feature, the temperature increases by a few degrees over the night. With its Effortless Restart feature, the unit automatically resumes its operation at its previously set settings when power is restored. 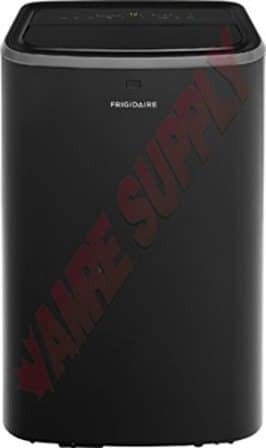 The FFPA1422U1 Portable Air Conditioner by Frigidaire has a voltage rating of 115V/60Hz and an energy efficiency ratio o 10.2. It can cool areas up to 700 square feet and its performance is ASHRAE certified. It is also ENERGY STAR certified. It has an included remote control that allows you to precisely control and change the fan speed and temperature from across the room. This also allows you to customize the operation times to fit your schedule – offering immediate comfort the moment you get home. It has a programmable 24-hour on and off timer that allows you to preset the unit in half an hour increments. It features a multi-speed fan that features three different fan speeds – offering more cooling flexibility. The FFPA1422U1 Portable Air Conditioner by Frigidaire has a supplemental heating capability – keeping you comfortable regardless of the outside temperature, giving you both cooling and heating solutions. 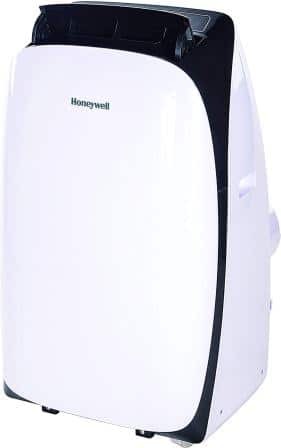 The Honeywell MN10CESWW has a washable filter design that protects the unit from hair and dust while extending its life and performance by reducing the impurities in the air. It is also designed with thermal overload protection on the motor and compressor – providing more safety precautions for extra peace of mind and endurance for you and your family. It has a full window kit set for easy and quick installation that could be used on both horizontal and vertical windows (the maximum hose length is 4 feet). It has a lighted feather-touch, front-facing control panel and display – allowing you to enjoy the convenience of easily viewing the current and desired thermostat settings. Its body is shiny and smooth. 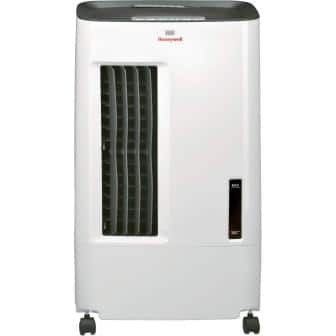 The Honeywell MN10CESWW cools rooms or areas with a size of 350 to 450 square feet. Its fan has three speed and it features a 24-hour energy saving timer with the use of the included remote control. It has a self-evaporation system which means bucketless operation that is able to remove 66 pints in a day. It could also be used in rooms with high humidity as it is equipped with dual drainage options for that added flexibility. It could be used as an air conditioner, a dehumidifier, and a fan. The Honeywell MN10CESWW’s dual motor technology means lower noise levels. The unit only produces between 51 to 54 decibels of noise at its highest speed setting. It also has a warning light that flashes as the unit stops operating when its internal tank becomes full. Shinco, or Jiangsu Shinco Appliance Co., Ltd, was founded in 1992 and is one of the major air conditioner manufacturers in China. Shinco has the number one growing rate in 2014 of 138%, among all major companies in the air conditioner industry. With their recent upgrade in factory facility and investment in R&D, they have now established new laboratories for engineering and testing of their products. Shinco is dedicated to developing environment-friendly and high-quality products for all consumers worldwide. 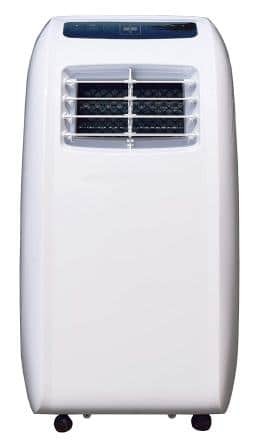 The Shinco SPF2-08C is an ultra compact portable air conditioner that is best suited for small areas like bedrooms or living rooms. It has a remote control and digital controls – allowing for easy operation. This portable air conditioner has multiple fan speeds, air flow directions, and cool settings that you could choose from. It is a 3-in-1 unit and could be used as an air conditioner, dehumidifier, or a fan. It has caster wheels to help rolling it around easier and includes a window installation kit. Its filter is removable and washable so it could be cleaned when needed. With its LED display, full-featured remote, 24 hour timer, and simple selections control panel, you are ensured to have disturbance-free nights. The Shinco SPF2-08C is a self-evaporative system featuring a self-evaporative cooling technology that is designed to cool its condenser coils with water and moisture from the air. This feature reduces the water that is collected in the tank, reducing the need to empty it. It has a dehumidifying capacity of 60 pints per day, helping stop the growth of bacteria and mold in a humid and hot environment – keeping your room cool and dry. The Shinco SPF2-08C makes use of the R410a refrigerant and has a quiet output of less than 52 decibels. A window kit and exhaust hose is included in the package, and installing the portable air conditioning unit requires no extra tools. It is pretty easy and simple to install; Shinco claims that it could be installed by anyone in around 5 to 10 minutes. 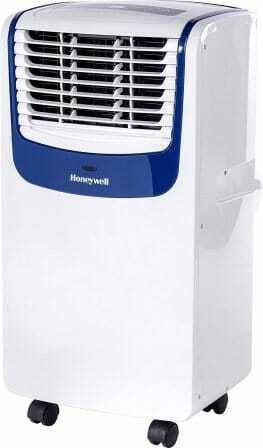 The Honeywell MO Series Portable Air Conditioner is black and white in color and is available in 8000 and 10000 BTU. While it has a quiet operation, it has a powerful airflow and could cool rooms of up to 350 square feet. It has digital controls, three speeds, and a remote control. Its exhaust hose has a length of 12 to 47 inches while its window bracket has a width of 19.7 to 47.2 inches. The Honeywell MO Series Portable Air Conditioner features auto-evaporation and no bucket is required to empty it. Its built-in dehumidifier has the capacity of removing up to 61 pints per day. For longer unattended operation, it has 24 hours with continuous drain option. It has a low watt and amp rating. 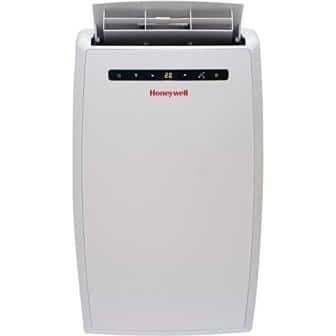 The Honeywell MO Series Portable Air Conditioner has a washable dust filter that helps catch dust particles in the air and preventing them from accumulating. It is indeed very compact and is one of the lightest units in its class. It comes with smooth-gliding wheels that make rolling it from room to room a breeze. It also comes with a window venting panel and a flexible exhaust to get it set up and running quickly. Della has made it their mission to change people’s thinking about appliances. They are committed to innovation and brilliance and their company’s youthful culture blends into their brand. Everything from the design of their products to their packaging and marketing is done with the new generation of consumers in mind. By offering a range of modern products for modern customers, their products breathe life into the traditional appliance industry. 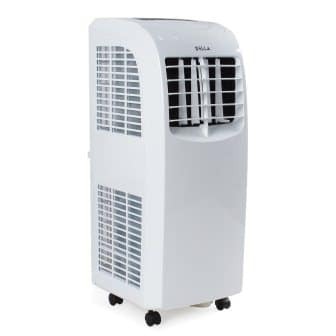 Della’s 8000 BTU portable air conditioner is white in color and has a durable solid wood casing. It has an overall dimension of 8 ¼ (W) by 9 ¼ (L) by 12 ½ (H). To keep down particulate and dust, negative ions are created around the clock. It has a variable fan setting. It has a temperature range of 62 to 82 degrees Fahrenheit with a 24-hour pre-set timer. It also has an LED display together with simple selection control panel that includes a mode selection button, a fan speed selection, and an up and down temperature adjustment button. This portable air conditioner has a voltage of 120/60H, an ozone output of 360 mg/hr, and a wattage of 21 watts. It is CE listed and cleans up to 3500 square feet. It uses ultra-low energy, therefore cutting down costs. The operating noise of this specific unit has an extremely low decibel rating so as to not disturb you from your sleep, work, or other activities. 8000 BTUs of cooling power is strong enough to allow for consistent cooling. 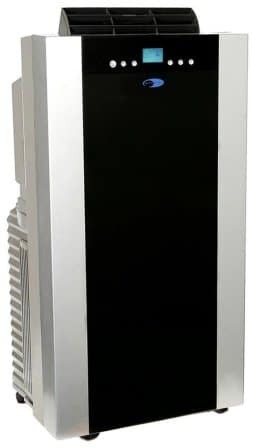 This portable air conditioning unit features electrostatic purification which is a powerful air purifier that significantly decreases tiny airborne pollutants (that are as small as 1 micron) such as pollen, dust, mold, allergens, smoke, unpleasant odors, pet dander, and other airborne irritants. The 24-hour programmable timer, on the other hand, allows you to set the portable air conditioner to cycle on automatically. It has caster wheels like other portable air conditioners for quick and easy mobility. It also comes with a window kit that allows for an easy installation in any room with a window. Ivation is all about passion and the people that are driven by them. They believe that their customers are insightful and will appreciate and recognize the originality of their talent that is reflected in their products. They are all about the products and the ideas that inspired them to create them. Taking innovation into all of their designs, no word or phrase can describe and communicate the authenticity and uniqueness of their products. The Ivation 10000 BTU Portable Air Conditioner has a touch button interface – a fully integrated control system with an easy to read LED screen. To regulate the room’s temperature to an exact degree (anywhere from 62 to 96 degree Fahrenheits or 17 to 30 degree Celsius), to switch from Celsius to Fahrenheit, or to cycle between modes, the handheld remote controller could be used. This portable air conditioner has a space-saving design and is relatively discrete in size and lightweight, with a unique hose-style exhaust that frees up window space – avoiding the unsightly mess of typical window units while letting in natural light. It also has easy-roll caster wheels – allowing you to take it freely from room to room. This portable air conditioner has a rated voltage of 120V AC. It has a frequency of 60Hz and a rated current of 5.7A. With a BTU/hr of 10000, it can deliver fast and effective cooling for areas of up to 400 square feet. It makes use of a single-hose system and has 5 multimode features: cool, fan. dry, auto, and sleep – auto and sleep is for easy and green performance. The Ivation 10000 BTU Portable Air Conditioner has an auto-restart feature, which turns the unit back on with its previous function settings when there is a power outage. Its remote control displays the current time and temperature while also allowing you to operate the unit from a distance. It also has a drain alert feature, which makes the unit beep eight times when the water accumulated has reached maximum level and requires drainage. A 7.54-foot power cord is also included in the package for additional reach. Black + Decker was founded in 1910 and has since put their focus on their customers’ needs. They are an American manufacturer of power tools, hardware, home improvement products, accessories, and technology-based fastening systems. The Black + Decker BPACT08WT is designed with a vertical motion – creating a powerful and steady airflow that provides consistent temperature throughout the room. Its filter is a slide-out one, making it easy to rinse under a faucet for a fresh air feel. It has four caster wheels for compact portability and easy movement. This portable air conditioning unit is bucketless and combines cooling, dehumidification and fan in one machine. It has a simple, noiseless, and quiet operation. It has an LED digital display that has simple, precise, and programmable electronic controls with a sleep mode and a 24-hour on and off timer. The Black + Decker BPACT08WT keeps a room of up to 150 square feet (approximately 10 by 12 feet) cool, pleasant, and comfy – especially during the summer. It works in sliding or double hung windows. It is rated at 115 volts / 950 watts / 60Hz. It makes use of the R600A refrigerant and restarts automatically after a power outage. This portable air conditioning unit has an exhaust hose with a maximum length of 4 feet and 11 inches. It comes with a remote control for convenient access to all the unit’s features from a distance. It has an included window kit and a manual guide for easy setup and installation. Its power cord is 84 and ⅜ inches long. Founded by the De’Longhi family, De’Longhi is an Italian appliance manufacturer – known to be a major producer of portable air conditioners and heaters. To this day, they have expanded their production and now includes several lines of small domestic appliances. They are known for the exquisite design and quality of their products. 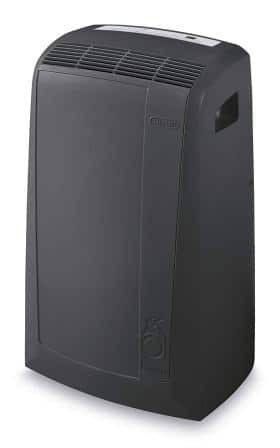 The De’Longhi PACN110EC Pinguino Portable Air Conditioner has an elegant black finish. It features a no-drip technology which automatically collects and recycles condensation within the unit – preventing leaks. It has a lighted display that is easy to use and features three fan speeds. It also allows you to adjust the thermostat and select modes. It has a full-feature remote control and a 12-hour on and off timer. It has a dehumidifying capacity of 16.5 gallons per day. The De’Longhi PACN110EC Pinguino Portable Air Conditioner is powerful enough to cool rooms of up to 350 square feet. 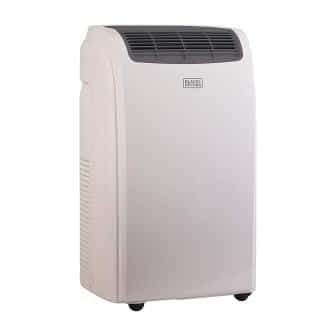 It is a 5500 BTU 3-in-1 portable air conditioner, dehumidifier, and fan. By only cooling the room that you’re in, this portable air conditioning unit by De’Longhi lowers your energy consumption thus saving costs. It operates quietly (maximum of 55 db(A)) so that you won’t be disturbed in your sleep, thanks to ts highly efficient components and compressor. It has a rated voltage of 110/120V, a frequency of 60Hz, a maximum input power of 1150W, and an airflow of 206 CFM. The De’Longhi PACN110EC Pinguino Portable Air Conditioner is easy to set up, requiring only a few minutes with no tools needed. A window bracket and exhaust hose is included in the package. It has caster wheels and handles to help you move it easily from room to room. Danby is a family-owned business that was founded over 65 years ago. They are known to create brilliant appliances that are mostly designed to be compact and portable – so that they won’t have any problem with fitting your space and your every move. Their products’ designs are classic and intuitive and are packed with a whole bunch of features to help you keep your life easy and organized. 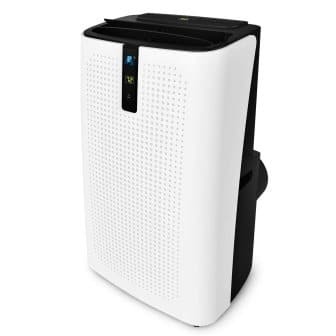 The Danby DPA100EAUWDB Portable Air Conditioner has a white finish but is also available in a black one. It has an LED display with electronic controls and comes with a remote control, allowing you to operate and control the unit from a distance. It has a single hose design that exhausts humid and warm air outside in an efficient way. This unit has a 3-in-1 design and could function as an air conditioner, a fan, or a dehumidifier. It also has an auto-restart feature which means that the unit automatically restarts after a power outage or failure. It also has a 24-hour on and off timer. It has a washable air filter that could be used over and over again. 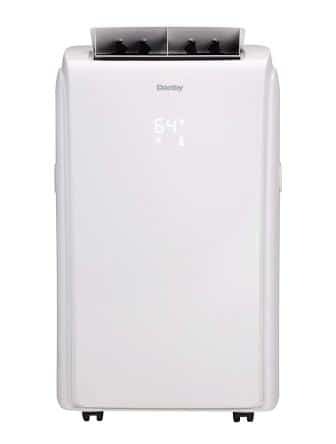 The Danby DPA100EAUWDB Portable Air Conditioner is rated at 10000 BTU and can cool spaces of up to 450 square feet. Its dehumidifier mode has a direct drain feature for continuous operation. It makes use of the popular R410A refrigerant. With a powerful 3-speed fan and an auto-swing feature, it performs really well and circulates the air in the room effectively. It has a variable temperature control ranging from 18 degree Celsius to 32 degree Celsius (or 64 degree Fahrenheits to 90 degree Fahrenheits). 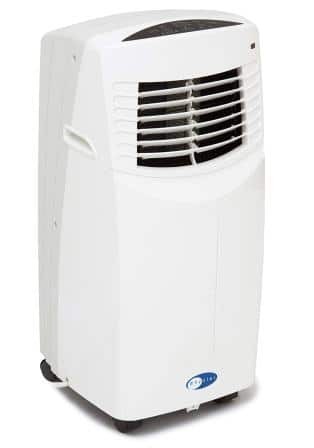 The Danby DPA100EAUWDB Portable Air Conditioner has 4 caster wheels, allowing for easy room to room transport. It also has integrated handles to help with that. 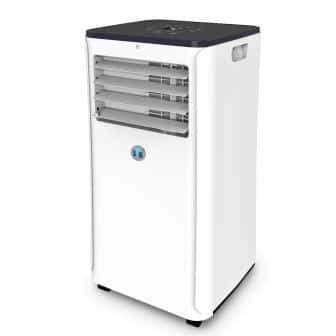 The Whynter ARC-08WB Portable Air Conditioner is specially designed to be lightweight and extremely mobile. It can be set up in almost any indoor space ranging from bedrooms and classrooms to data closets, server rooms, and garages. It has an amazingly compact design which is perfect for spaces with limited floor space. It has a full-function remote control, a digital thermostat, and a two-way directional air louvers. It has a washable pre-filter that is geared towards removing large particles such as pet hair and dander and an activated carbon filter that is designed to neutralize odors such as smoke. The Whynter ARC-08WB is a compact lead-free and CFC-free portable air conditioner with a high energy efficiency – helping you stay cool while reducing energy consumption. It makes use of the popular green and eco-friendly R410A refrigerant and has components that are RoHS compliant. It can cool down spaces as large as 250 square feet. The Whynter ARC-08WB features a self-evaporative system that is there to exhaust most of the accumulated condensate – reducing the need to empty its tank. It also has an auto-restart feature that comes in handy when there are power outages. It has a noise level of less than 53.6 dbA. Costway was founded in 2008, with the goal of helping customers achieve satisfactory product quality with the best price. They have grown to be one of the top retailers in Europe and North America. They have a high market sensitivity and are devoted to developing better and more diverse products. They offer assistance to their customers and provide them with thoughtful customer service. 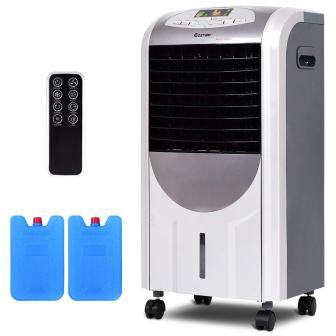 The Costway 23664-CYPE-CS Portable Air Conditioner is a portable evaporative air cooler. Cool air is distributed through the honeycomb cooling media while air is cleaned by the dust filter. Its remote control allows you to easily control and change the unit’s settings. It could easily be rolled from room to room for use anywhere in the house, thanks to its 4 caster wheels. 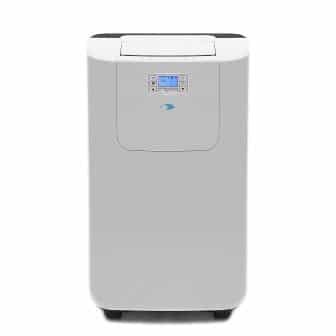 It has a removable and washable filter that prevent dust, bacteria, and other airborne particles from entering the unit. By generating negative ions, the anion it comes equipped with purifies and sterilizes the air in the room. It has a wing feature, an 8 hour timer, and 3 fan speeds and modes to further customize your cooling. It has a user-friendly LED control panel and a 19.5-inch far-range remote control that receives and transmits signals at a 60-degree wide angle. The Costway 23664-CYPE-CS has a non-compressor system that cools rooms efficiently, naturally, and inexpensively with no power-hungry components. It also has 2 ice-crystal boxes that is designed to enhance its cooling performance. It has a rated voltage and frequency of 110V and 60Hz, respectively. Its dan mode power is 75W while its heating mode power is 2000W. The Costway 23664-CYPE-CS could also be used as a heater, humidifier, and air purifier – making it economical. When used as a heater, it is heated by the PTC heater which has a high conversion efficiency between electricity and heat, delivering quick and rapid heating. Its water tank has a capacity of 7L. The three fan modes are normal, natural, and sleeping and the three fan speeds are low, middle, and high. The heating temperature could be set as low or high. The Whynter Elite ARC-122DS is a compact-sized portable air conditioner that has a dual hose system – facilitating more efficient cooling and better space utilization. It comes equipped with an intake and exhaust hose – allowing for more air intake, constant air pressure, and cooling power which results to a quicker cooling rate than single hose units (this unit can be operated as single hose as well). It comes with a remote control to easily control the temperature, speed, and dehumidifier settings from a distance. It also comes with caster wheels so you can move it around easily. 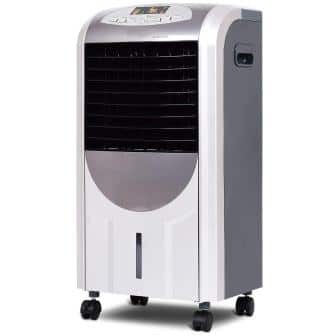 The Whynter Elite ARC-122DS Portable Air Conditioner has a 12000 BTU cooling output. It has a dehumidifying capacity of 76 pints per day. Setting the unit to run only when needed helps save energy and money. It cools rooms of up to 400 square feet. Its adjustable digital thermostat allows you to control the temperature with a range of 61 to 89 degrees Fahrenheit. It also automatically restarts after a power outage. Its power consumption is rated at 1000W or 9 amps. 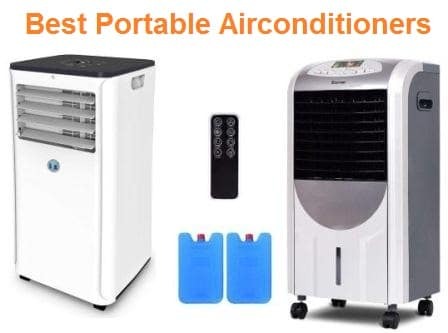 The Whynter Elite ARC-122DS Portable Air Conditioner comes with a protective storage cover bag with pockets to protect the unit and its window kit, exhaust house, and remote control when not in use – keeping dirt and dust from accumulating in the unit while in storage. The LHONE 5 in 1 Compact Portable Air Conditioner has an electronic display and remote control. Its LED control panel is user-friendly and lets you see what speed, mode, and timer option that the unit is set to easily. The remote control, on the other hand, enables you to control the unit’s timer, power, and wind settings from across the room. It makes use of a superb honeycomb cooling pad – ensuring a high cooling level. It is equipped with anion for the sterilization and purification of the air in the room by generating negative ions. It has a swing feature, and 8-hour timer, and 3 fan speeds and modes to choose from. It also has 2 ice crystal boxes if you wish to enhance its cooling performance. The LHONE 5 in 1 Compact Portable Air Conditioner is multifunctional – letting you use it as an air cooler a heater, a fan, a humidifier, or an air purifier. Temperature is reduced through its water evaporation system and is increased using its PTC heater. Its air purifying function and its removable and washable filter allows you to breathe a cleaner, fresher, and healthier air by releasing anions that remove airborne pollutants such as pollen, mold, smoke, allergens, pet dander, unpleasant odors, dust, and other airborne irritants. It has a voltage rating of 110 volts and a frequency rating of 60Hz. The LHONE 5 in 1 Compact Portable Air Conditioner is easy to move and store as it is compact and lightweight and fits discreetly in most spaces. It has 4 caster wheels that help in moving it around. Midea is committed to improving lives by sticking to their principle of creating good value products for their customers. They offer a diverse range of products like consumer appliances, HVAC, and robotics and industrial automation. They are focused on continuous technological innovation in order to improve their products and services with the aim of making lives more pleasant and comfortable. The Midea 10000 BTU Portable Air Conditioner has a full-function LED remote control to access your settings. It features a sleep mode that automatically adjusts the temperature through the night to align with your body’s natural sleep cycle for maximum comfort. It has a reusable and washable filter to maintain air quality. The Midea 10000 BTU Portable Air Conditioner has an eco timer that allows you to save energy and get a better night’s sleep It can cool spaces that has a measurement range of 100 to 150 square feet with a temperature range of 62.6 to 95 degree Fahrenheits. It has a noise level of only 52 to 53.4 decibels. 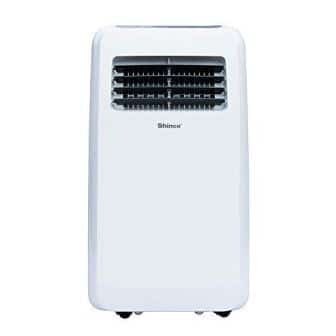 The Midea 10000 BTU Portable Air Conditioner’s power cord has a length of 75 inches. Its drain hose, on the other hand, measures 59 inches and its window bracket length ranges from 26.5 to 48 inches. The unit measures 17.13 by 13 by 29.13 inches. It has a SACC rating of 5500. It comes with attached wheels to provide greater versatility of movement. The CCH YPLA-08C Portable Air Conditioner has a white finish and an LED display It has a washable and reusable air filter which is a cool feature as it will save you money on replacements. It has the unique ability that regulates the room temperature in your house. It has a remote control which allows you to access and control the machine from a distance – eliminating the need to stand up just to go and adjust the temperature. It has a 24 hour on and off button – allowing you to regulate and monitor the unit. The CCH YPLA-08C Portable Air Conditioner is an air conditioner, fan, and humidifier combo. When used as a fan, you won’t have to worry about super hot days. Using it as a humidifier, on the other hand, adds moisture to a dry room. It cools up a room of up to 200 square feet. It has an energy efficiency ratio of 8.9 – making it energy efficient and allowing you to save on your electricity bill. It has a voltage rating of 115 volts. It is capable of removing up to 2 pints of moisture per day. Its decibel rating is only 55 dBa. 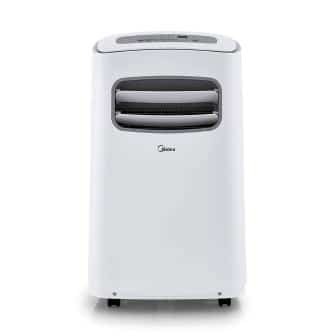 The CCH YPLA-08C Portable Air Conditioner is manufactured under the ISO 9001 quality standards. It is also TAA compliant and meets all Green Compliance Standards. It weighs in at just 47lbs. Its dimensions are 12 inches (H) by 27.80 inches (W) by 13.30 inches (L). A single hose and drain hose connection are included in the package. A subsidiary of Guangdong Gosun Group, JHS has 2 factories in China with 6 air conditioner assembly lines. Established in 2004, JHS have sold their products to more than 50 countries all over the world. They have established and executed high-quality assurance and control standards with rigorous inspection procedures at each and every step of their production process. Their processes and products have passed a dozen of international safety and quality certifications and environmental protection. The JHS A018-12KR/A Portable Air Conditioner has an LED display screen with a remote control that allows you to control and change the unit’s settings. It comes equipped with operating modes for cold air conditioning, dehumidifier, and fan. Its dehumidifying capacity is rated at around 60 pints a day. With its intuitive design, there are no extra tools needed for both installation and assembly. The JHS A018-12KR/A Portable Air Conditioner comes in three BTU levels: 8000 BTU, 12000 BTU, and 14000 BTU. The 12000 BTU unit is compact and quick-cooling – cooling a 270 square feet room in more or less 30 minutes. It makes use of the eco-friendly and CFC-free R410A refrigerant. Its temperature range is adjustable from 61 to 88 degree Fahrenheits. It has a noise level of around 54 dB. It has a maximum power consumption of 1320W or 11.5A. The JHS A018-12KR/A Portable Air Conditioner is equipped with four reliable and all-direction caster wheels – allowing portability and ease of moving it around and installing it anywhere it is needed. It has a dismountable and washable 3M electrostatic filter. The package also comes with a window kit, a drainpipe, and an exhaust hose. 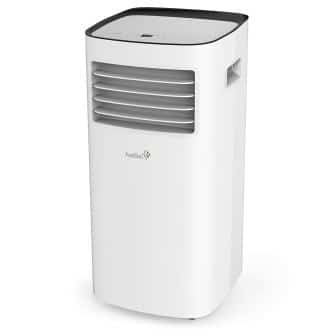 The Honeywell CS071AE Portable Air Conditioner has a washable carbon activated filter that traps pollutants, dust, and odors. It comes with a convenient remote control – allowing you to operate it without getting up. It has five speed settings and multiple fan options so you could alternate between gentle humidity and targeted spot cooling. The Honeywell CS071AE Portable Air Conditioner reduces temperature through water evaporation. It has an extremely low power consumption of only 32W at its highest speed. It comes equipped with the patented brushless motor technology with low energy-quiet mode that minimizes both the sound level and energy consumption, which makes it ideal for long hours of usage. It has an unobtrusive, whisper-quiet motor. The Honeywell CS071AE Portable Air Conditioner can be used as a humidifier during winter months – giving you the best of both worlds. It is also lightweight – weighing only 12lbs and comes with smooth gliding caster wheels.